Just reading the awful news from Thousand Oaks this lunchtime, near to Richard's home...hopefully he and his family are all safe and well. with respect to Richard's home ? Best wishes to Richard Carpenter and his family. Too sad, that we awake to even more sad news. Only around six miles from Richard's home. Awful news wherever in the world it happens. And the sad thing is is that it's expected. It will always move us even if we begin to get numb. Change needs to happen - no matter where you land on the political spectrum, we're all human beings and all of our lives have value. I actually just booked my flights for the 50th Ann this morning as the news was breaking. Pray that the Carpenter family are all safe. This is shocking. Does anyone know how close the wildfires are to Richard? Homes are being evacuated near Thousand Oaks according to the news. Does anyone know how close the wildfires are to Richard? Thanks. Hopefully a safe distance. Just saw on the news that there are reported fires in the area of Westlake Village and they are advising some residents to evacuate. That is very close to Richard's home, hope all is well. 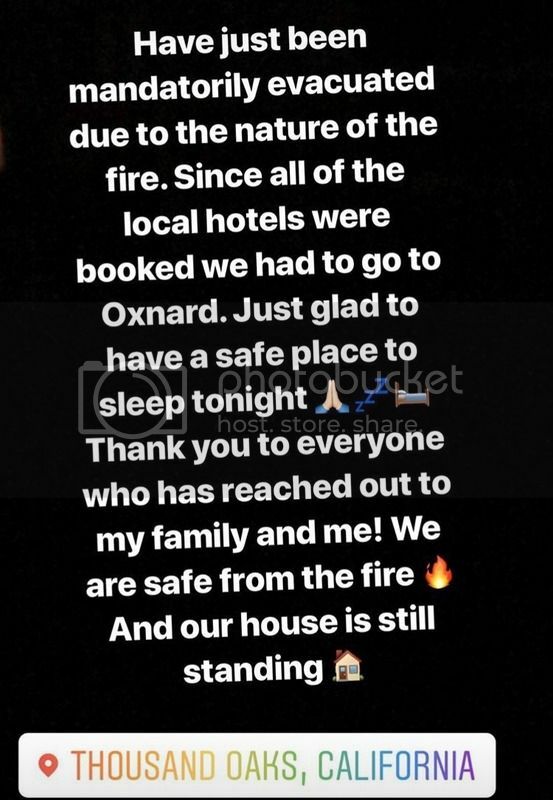 Very sad turn of events for the Thousand Oaks community. News from the Carpenter family via Colin’s Instagram. Hope the Carpenter family are safe and well. BBC news were showing live footage this morning of the fires (obviously overnight there) and talking to a newspaper editor from Thousand Oaks after a horrendous week there.Glad Richard and his family are safe.Thanks to Colin for social media updates in no doubt difficult circumstances. I'm glad that Mr.Carpenter and his family are ok. Sadly,Jarred these are the signs of the times of the days that we now live in. Don't mean to go on what would be considered "religious" on anybody, but these are the times that we should look to God for hope,help and strength in these trying times. I'm an atheist but I def believe in the power of spirituality. I'm glad to hear that Richard and family are safe. How about his neighborhood, are they still under evacuation? Is the YOM wherehouse in danger? My thoughts and prayers are with all victims of these devasting wildfires and that horrific mass shooting in Thousand Oaks. Thousand Oaks has been through pure hell the last several days. Sending good vibes and prayers to Richard, his family and all residents there. They need a break! After looking at the photo of Colin, he definitely resembles his Dad. Give him Richard's 70's hair style and it would be tough to tell them apart except for the height! After looking at the photo of Colin, he definitely resembles his Dad. Give him Richard's 70's hair style and it would be tough to tell them apart except for height! Colin has a smaller face though.